The creative make of this Howard Miller Scarborough Grandfather Clock adds to the symphony of your dcor. Finished in Golden Oak on select hardwoods and veneers. 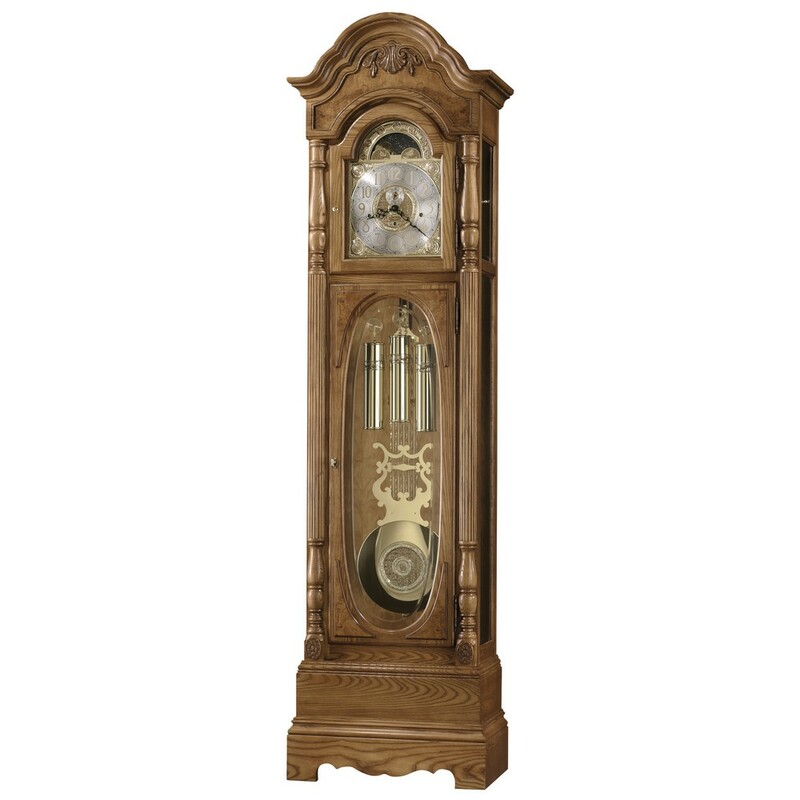 This elegant floor clock features rare, bookmatched olive ash burl and a raised shell and vine overlay which enhances the graceful bonnet pediment. The polished brass-finished dial offers elaborate corner spandrels, a center disk, a silver chapter ring with applied brass Arabic numerals, and an astrological moon phase dial. 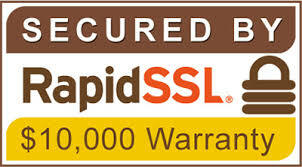 2 year warranty on parts and workmanship. This item ships via freight. Please allow 2-3 weeks for delivery. 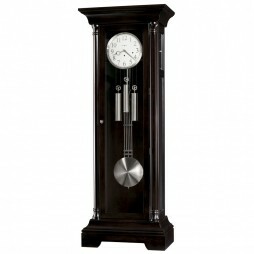 A new look to a classic design, the Urban Floor III Grandfather Clock offers modern elegance. 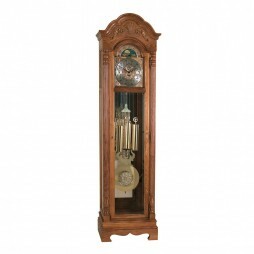 This clock has simple lines with a flat-top pediment and nickel finished molding, doorknob, weights and pendulum, . A crisp, white dial is highlighted with understated hour markers and nickel finished bezel. Constructed from select materials, hardwoods and veneers, it is finished in Black Satin and features beveled glass on both the upper and lower doors. Other features include a cable-driven, Westminster chime Kieninger movement with an automatic nighttime chime shut-off option, a locking door, and adjustable levelers under each corner for stability on carpeted or uneven surfaces. Once you return the enclosed card to Howard Miller, you will receive an heirloom plate, engraved with the name and date. 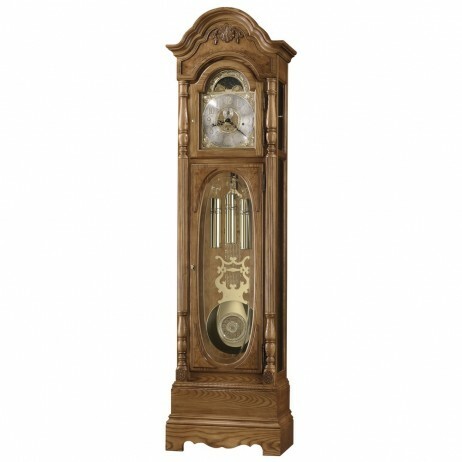 A decorative vine pattern and cerejeaira overlays accent the classic bonnet of the Clayton Grandfather Clock. The special cast dial features elaborate corner spandrels and center disc with an astrological blue moon phase. Constructed from select hardwoods and veneers and finished in Oak Yorkshire, the clock showcases a crystal-cut, V-groove, oval glass with cerejeira on the top and bottom corners. An illuminated case highlights the brass pendulum and weights that feature a decorative cast pendulum bob and matching weight bands. The multi-tier base supports reeded columns with turned column caps with complimenting overlays. Enjoy the concerto movement that plays Westminster chime, Shubert's “Ave Maria” and Beethoven's “Ode to Joy”. The clock features an automatic nighttime chime shut-off option, an interior cabinet light and locking door. You will receive a heirloom plate, engraved with name and date, by returning the enclosed request card to Howard Miller. 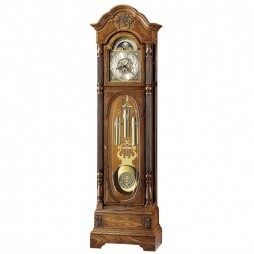 Creating a realistic look, this Howard Miller Seville Grandfather Clock is a perfect addition to your room. 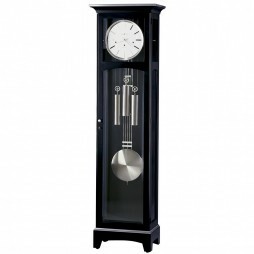 This classically inspired floor clock makes a grand addition to our Furniture Trend Designs. The simple, yet elegant, flat top pediment of this floor clock is reminiscent of classic Greek and Roman architecture. The crisp, white dial is framed by a brushed-nickel bezel and features applied, brushed-nickel Arabic numerals with a black screened minute track and nickel hour and minute hands.